Welcome to the English webpage for the Volksentscheid-Fahrrad! Have you heard about Berlin’s Bicycle Referendum, the world’s first citizen-initiated cycling referendum? We’re passionately pursuing the goal of making Berlin more bicycle friendly by channeling popular support for a sustainable and healthy city. So far, we have had an overwhelmingly positive reception of our quest to make Berlin’s administration invest in an environmentally friendly future. We have the responsibility, as citizens of Berlin, to set a good example and send a signal to the world that cities can start acting now. In November 2015 more than 30 citizens participated in a workshop to find the 10 most important objectives to improve cycling conditions for Berlin. In December they informed the media. Since then, the debate about what we want our city to be has been front and center in public discourse and the media reception has been hugely positive. Click here to read our 10 goals. In January 2016, Germany’s first “Gesetzes-Hackathon”, a legislation-hackathon, took place. 30 lawyers and cycling experts ran down a 24-hour agenda and ended up with a first draft of the Berlin Bicycling Bill, the RadG (you´ll find some tweets with hashtags #BerRG and #RadG). Later, they improved it, talked with lots of insiders directly working in the Transport Senate, and set up two online public input sessions. Finally, in April 2016, we presented Berlin’s and Germany’s first draft cycling law. Since the end of May, we have been collecting signatures in support of the implementation of the legislation, the RadG. 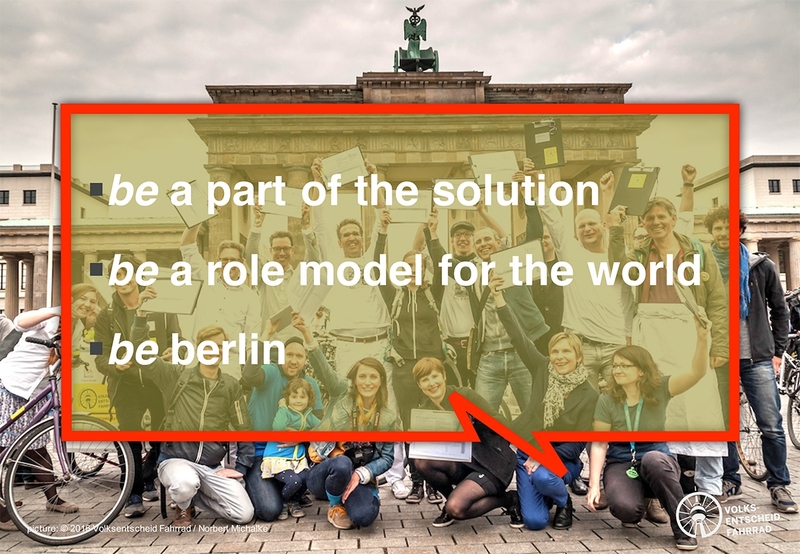 We need 20,000 signatures to make Berlin’s Parliament vote on the bill. If it is not enacted by the parliament, we will take Berlin’s Bicycling Bill to the next step, a referendum. Then, we will need to gather 180,000 signatures to achieve a Berlin-wide referendum on the implementation of the bill. If all goes well, that would take place in September 2017 along with the federal election. A lot has already been achieved with the huge public debate that has been opened. It looks like cycling policy might become one of the top 3 policy issues in the upcoming Berlin state elections in September 2016. More than 60 scientists issued a joint statement, demanding that Berlin’s mayor act now and pass the Berlin Bicycle Bill. The mayor Mr. Michael Müller is also spokesperson of metropolis, a worldwide network of mega cities from 140 countries, a key player inthe upcoming HABITAT III process. A description of our goals. An arcticle by Mikael Colleville-Anderson, the “pope of urban cycling worldwide”: http://www.copenhagenize.com/2016/04/berlin-decides-its-future.html (“There are great activists out there in the world, but this group has taken it to the next level.“). For media contacts please write to presse@volksentscheid-fahrrad.de or contact Heinrich Strößenreuther, +49 160-9744 2395. Thanks for your interest and please spread the word! Cycling is healthy, environmentally friendly, and fun! And, unlike motor traffic, it doesn’t contribute to air and noise pollution. More people would choose to cycle in Berlin if conditions were safer and more comfortable. 350 km of new cycle streets shall be created by 2025, each one at least 5 metres wide with priority for cycling. Every main road shall have a cycle lane or cycleway, at least 2 metres wide and at a safe distance from parked cars. In 2013, cycle safety discussions identified the 50 most dangerous junctions in the city. These junctions shall be made safer. An online discussion identified places where the cycleways need repair, due to tree roots, potholes or other damage. These hotspots shall be taken care of. By 2025, 200,000 new, safe and practical cycle stands shall be installed in the city: 100,000 outside public transport stations and 100,000 in residential and business districts. Traffic signals shall be optimised so that people cycling at 20 kph would pass through at least 3 junctions on a green light. By 2025, 100km of fast cycleways shall be introduced along typical commuter routes, offering an appealing alternative to going by car. Every police headquarters shall have a Department for Cycle Traffic which will take action against those who commit acts endangering people cycling or walking, as well as cracking down on illegal parking, speed violations and dangerous driving. Sufficient roles shall be created in the senate and in regional government for planning and coordination of traffic improvements. The individuals filling these roles shall publish quarterly reports on the progress of these projects online. Each year, Berlin shall invest in PR to prepare the city and its people for a future with more cycling. There will be plenty of public reports on the progress of these projects, and their benefits will be promoted widely. We’re looking for volunteers who would like to get involved, in particular: planners, including those with a managerial background; creatives who can offer support with photography, illustration work, social media management, graphic design, videos, music, and events; plus people who can offer donations of the tools, funds, or venues we need. Just get in touch via info@volksentscheid-fahrrad.de to find out how you can get involved! You can also sign our petition, and follow us on Facebook, Twitter and Instragram!